Interested in providing your child with an enriching and joyful musical experience that goes beyond the private lesson? ​Located in Dallas, TX, Primo Piano Studios offers a creative and uplifting environment where children can learn the language of music in various styles, gain confidence in performance, and create and collaborate alongside their peers. 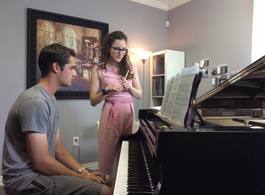 We offer private and group lessons to students of all ages, with unique options to aid students in their individualized journeys. Creative music experiences and recitals! Get to know our artist faculty. What makes our studio unique? Learn more about our tuition packages.